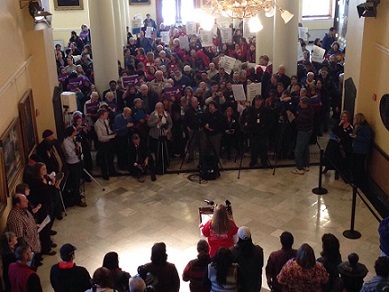 Yesterday over 350 MPA members and allies rallied in Augusta to demand that the legislature accept the federal funding and stop denying health care for 70,000 Mainers. If you were able to come yesterday, thank you. 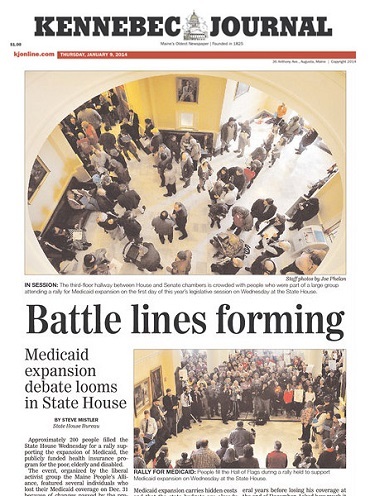 Together we made our voices heard and legislators took notice. We completely filled the giant Hall of Flags in the Capitol. 20 brave Mainers who are being denied care told their stories publicly, including U.S. Navy veteran Thomas Ptacek. “We are called to shine light on those in darkness, to heal the broken and not leave them by the side of the road,” declared Pastor Rick Ness of Wales. After the rally, we packed the halls and asked our legislators to do the right thing. The crowd was so thick you could barely move. 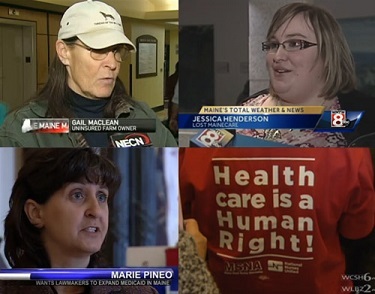 The TV news last night was filled with regular Mainers telling their stories. And we made the front pages of newspapers all over Maine! This is a good start, but there's a lot more to do over the next few critical weeks to make sure we end the suffering and pass health care expansion. Can you stand with those who rallies yesterday and give $10, $25 or $50 right now to help us win?